Quick Links: Added front and rear valance to my SR5 Chrome blacked out today :) TRD pro wheels, how to keep clean?!?? Best Portable Air Compressors The Wife's 2018 offroad prem BUILD!!!!!! (im jelly) Door edge guards and body side moldings? 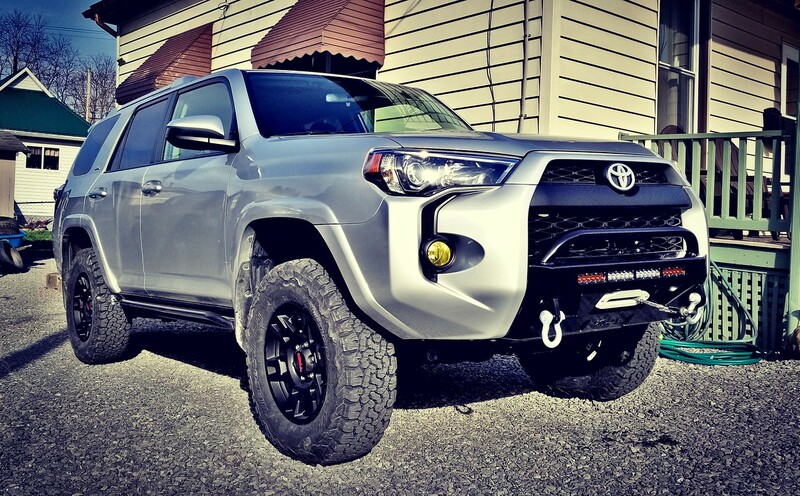 Discussion in '5th Gen 4Runners (2010+)' started by Allaboutfamily, Apr 14, 2019 at 3:25 PM. 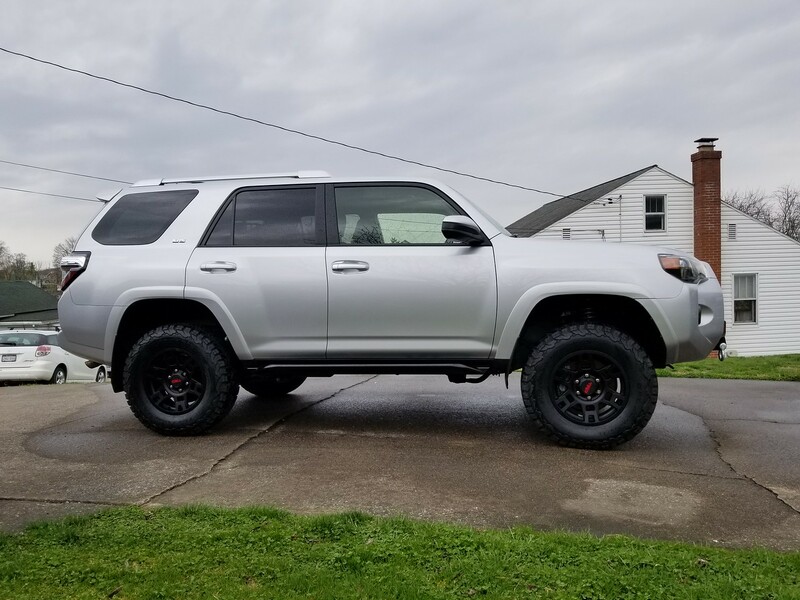 So my beautiful wifey and I went out yesterday looking at vehicles and she bought herself a brand new 2019 4runner TRD off road premium in magnetic grey. She has informed me that she needs a lift and larger tired immediately. My wife breaks her back helping everyone around her so I want to do whatever I can to make her happy. She deserves it. I’m here to learn more about this truck so I can put a proper lift on it. I’m not new to lift installs, have done 20 or so over the years on trucks, cherokees, cj’s, and Wranglers. I’ve done some reading here on lifts but there is a lot to take in so I’ve decided to ask some questions. First, I understand from experience that there are different levels of lifts, some ride better than stock suspension, some ride worse, some change it very little at all. Also, the needs of a serious off roader is entirely different than that of a mom who will never see off road use. So the quality of lift needed would be different. With that said, I’m wanting to fit 285-70-17 on my wife’s new ride. I’ve gathered I’ll need between a 2.5-3” lift. I’ve also read that some suggest new UCA if you go above 2.5. Ride is very important to her. she doesn’t want a log wagon but could tolerate a tad bit more roughness. My budget is preferably $500 but if absolutely necessary, I could stretch it as far as $1000 for the lift. And I’m considering running stock wheels with 1” spacers but she may make me change those, too. WallyT4R, troprobped17 and Strandskov like this. In that price range, you're pretty limited. You can raise the front up to 2.5" with bilstein 5100's. You could use spacers on the rear since she doesn't plan on doing any off-roading. UCA's might put you over your budget. I'm sure you'll get a lot more input. Good luck with that budget. Sounds like a cheap spacer lift is in your future. Check out Wheelersoffroad.com. For lifts but they will run you at least 1000. Thanks guys! I have no issues with a spacer lift if it will achieve the needed lift without causing any harm. I’ve ran spacers on jeeps and trucks with no ill effects. Just not sure if it’s ok on a t4r? That’s why I’m here: attempting to find an affordable and SAFE solution to clear larger tires (285’s) on a vehicle that will never be wheeled. I certainly don’t want issues for my wife and kids. Strandskov and Thatbassguy like this. Welcome from FL. You'll get the advice your looking for on this forum. Nice 4R and welcome to the forum. Lots of options out there for lifts and if it’s not going to see Offroad use and abuse (famous last words) a spacer lift will suffice. But I’d recommend at the minimum 5100’s up front and new shocks and coils for the rear instead of spacers. Talk to Dan at wheelersoffroad and they should be able to set you up. jester243, jgcaps and Strandskov like this. Thank you. I know bilstein makes a quality product and it would probably give her a better ride, too. I’m kinda leaning towards the 5100’s all thr way around. What are the advantages to new coils in the back verses just spacers? I’m assuming it’s the ride quality? I’m sure I’ll change out components at a later date to upgrade to better quality stuff. We didn’t trade in her 2015 car because the trade offer was just too low so I’m sure I’ll be eating 2-3k when i sell it over the next two weeks. Between that, trying to fork out stuff to lift my super duty, plus having to buy her new tires, wheels, and whatever else, the savings is getting thinner that I like. I’m trying to accomplish her lift as cheap as possible without sacrificing ride quality until I can upgrade in a couple of months when the bank account fattens back up. Appreciate all of you guy’s help. Will the 2.5 lift that comes from the 5100’s be enough lift balance to make 285’s look good? She wants a mud tire for the looks but I just don’t think she’ll enjoy the roar that comes with those. jgcaps, Backslider and Strandskov like this. A lot of guys are running falken at3w's and happy with the looks and performance as well. jgcaps, WallyT4R and Strandskov like this. I like the BFG, they’re a good tire. The duratracs look closer to the aggressiveness of a mud is why I’m considering those. You’ve got the same wheels we do but she doesn’t like them. We looked at a 4r at one dealership that was absolutely identical to the one she bought but they had these wicked looking wheels on them, I think maybe Pro wheels. She really wanted those wheels but that dealership’s “best deal” was $2500 more than this one. All the exact same options and even color, only difference were the wheels. I've heard that duratracs get pretty noisy as they wear, so you might want to just look at M/T's. Owning 3 sets of Duratracs personally. I can say the only time you might hear (a slight noise) from them is in a 35" + diameter. And that is @ idle. The tires are awesome & will continue to buy. The only thing they could do better in is the rain. That is our T4R wit 31" vs my Dodge with 35". WallyT4R, Strandskov and Thatbassguy like this. I stand corrected. Maybe the people who say they get noisy are the same ones that say the KO2's are noisy. How many miles have you put on them? First bold. You end up preloading the coil spring which will result in a firmer ride and reduced compression capacity. If you look at an OME coil next to a stock OE coil they are at least 1.5” taller. Second bold. Best bet is to fatten up the saving account and do it all right the first time around. Wheelers, dobinsons, toytec all offer a variety of options that will work and won’t break the bank. I went with Old Man Emu on all 4 corners for around $1100 out the door. I opted for medium springs up front and heavy in the back due to what I do and it’s a firm ride unladen. If you go with light duty coils it’ll get you the lift you desire and a little firmer ride (of course subjective). I’m running stock UCA’s and the caster was a bit out of spec and takes a little more steering wheel action to keep her straight down the road. jgcaps, SC2SC, WallyT4R and 2 others like this. It was a previous gen Pro then. This year is atrocious blue with a 1/2 FJ roof hack...I mean roof rack. SC2SC, WallyT4R, Backslider and 3 others like this. 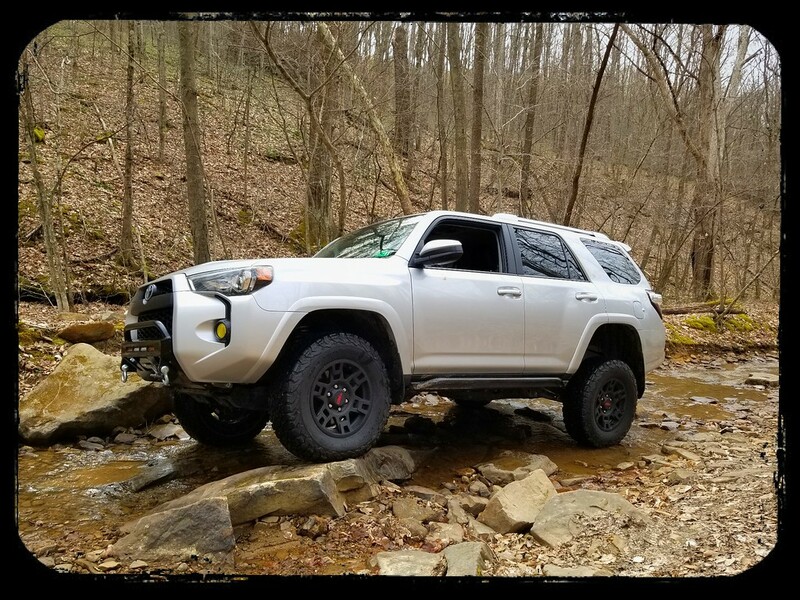 4runner fun: thanks for the pic. im certain that’s the look she wants. Im leaning towards the duratracs heavily. I’ve got new 35” dynapro MT’s being dropped off by fed ex tomorrow for my super duty. once she sees them, I’m expecting her to say “that’s what I want” lol. Thanks 4x4R, you’ve been extremely helpful. What size lift are you runnin? My wife is a speed demon And hauls around our youngest son and our new grandbaby regularly so, gotta make sure she’s safe. Netted about 3” with the OME suspension. I’m running 285/70/R17 BFG AT KO2’s. SC2SC, WallyT4R, Strandskov and 1 other person like this. Newest on the T4R. Oldest on my '94 Ram diesel. Another set on '04 F-250 diesel. My snow plowing partner has them on his '06 F-350. (Used to use Nitto terrain grapplers; would just pack with snow. I have at least 80k miles on this series of tire. The '94 are @ around 50k & need to be replaced due to a bad alignment. The '04 are @ 20k miles & looking almost new! I rotate them every 7k mile synthetic oil change in the diesels. The T4R has 400 miles on the tires. These are 10ply LT tires if ordered. The life is as good as any street tire! *note* I used to run the Nitto Mud Grapplers. They were loud as hell. Great in snow & mud. That is about it. Rant over. Let me know if you need any more info. Allaboutfamily [OP] and Strandskov like this. Yeah, I was just curious if you had any with high mileage. Most guys that complain about how noisy they got probably didn't rotate them. I went with KO2's because of the available load range "C". I vote an Eibach Pro Truck lift, I love mine. Everyone seems to say it rides a bit softer and smoother than the Bilsteins, which I have found to be pretty stiff on the Jeeps I have used them on. The fronts are adjustable just like the Bilsteins, so if you add weight later you can set it up a notch to compensate. Mine is on the second notch since I have the bumper and winch. The Eibach is slightly stiffer than stock, but in a good way, it feels more solid, less like a sloshy SUV. Here is mine with 255/75/R17s, went with that size to maintain performance, and C rated tire, which is lighter and rides better. jgcaps, SC2SC, nimby and 4 others like this. Sharp ride 4x4R! I think she’d be pleased with that setup. The BFG are a great looking tire as well. I’d be happy with either the dutatracs or BFG on her ride. 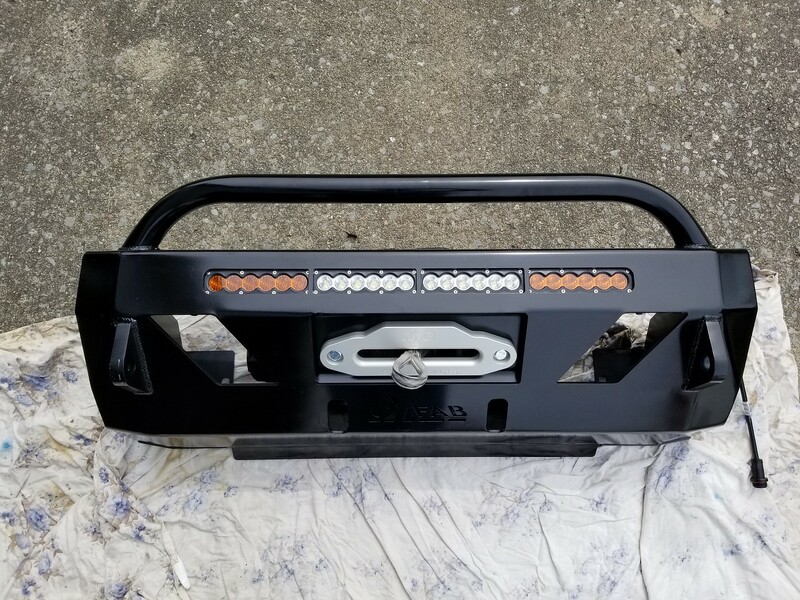 She’s also wanting an offroad bumper with red shackles (they had one like it on the showroom) but I’m not willing to cut the front bumper to fit one. Not sure what to do to satisfy her on that aspect. Don’t know if she’d like a bull bar or if they even make one for the 4R. Jtice, thanks for that info! That’s a perfect price range so I’ll certainly reshearch that option. How tall are your tires? Tell me about your front bumper. What brand, what all had to be cut? Can ya order one without the winch access? You might consider the nitto ridge grappler tire? I have a pro, so it came with nitto terra grapplers, which are great in everything except mud and ride pretty quiet and handle nicely. The terras don’t look very gnarly, but I’ll upgrade to the ridge when these wear out. JET4, Allaboutfamily [OP] and Strandskov like this. Whichever tires you choose, they will surely be better than those Dunlops! Mine were gone at 1300 miles, and I know others have dumped them even sooner than that. I'm glad I'm not the only one who isn't a fan of this new blue. The Cavalry Blue was great, Smurf Blue I could do without. OP, +1 for K02s. Great all around tire, long lasting, quiet on the street and very capable offroad. Ive not measured them, but they should be about 32" diameter. 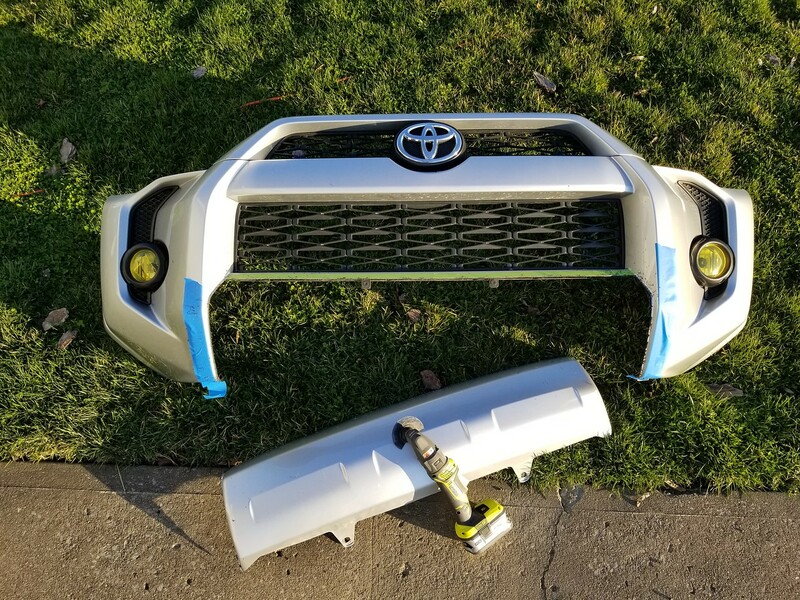 The front bumper is a C4 Fab Lo-Pro bumper. Dont think you can get them without the winch access though. jgcaps, SC2SC, stewtopia and 3 others like this. I’ve decided on the eibach lift. Still up in the air on the tires. Will probably boil down to if I can find the BFG or duratrac locally and which one is priced better. Wheels I’m still not sure of. If I do go with new wheels, what’s the least offset I can run with a 3” lift and 285’s before I run into issues? Again, I really appreciate everyone offering their feedback. I know all of this has been discussed a million times here but wow, it becomes overwhelming trying to read it all AND filtering what pertains to your exact situation. It’s completely different doing this on a rig that carries my wife, kids, and my year old granddaughter around daily, and doing it on a rig thats just mine. jgcaps, nimby, Thatbassguy and 1 other person like this. Not a fan of the color or the rack.